Squirrels driving you nutty? Call Gopher Patrol, the experts of rodent eradication. Squirrels look cute but can cause extreme damage to your property. Ground squirrel eradication begins with exterior control. Our skilled, radio dispatched technicians begin by strategically placing squirrel stations around your property. Squirrels are allowed to enter the stations so that they can access and consume the bait in them. Our squirrel removal technicians will generally follow-up approximately once a week for a total of three weeks for maintenance on the stations and to refill the stations with bait as needed. Once we finish the squirrel eradication, you will see the difference on your squirrel-free property. Because we cannot force the squirrels into the stations, we recommend going on monthly squirrel control service. With over 20 years of experience in squirrel eradication, we have found that ongoing monthly maintenance is the best way to keep your squirrel population suppressed. 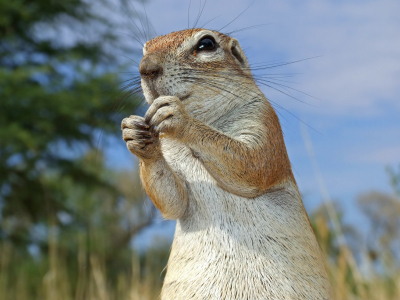 We also recommend having a skilled Gopher Patrol technician inspect your home and especially attic for openings that squirrels might take advantage of, as squirrels are well known for using attics for shelter. If you would like to know more about our squirrel control program or any of our pest control services, call us today or fill out our online form to request an appointment. As Southern California’s Top Rated Local® pest control company, we are truly experts at rodent eradication! A squirrel is a small or medium-sized rodent of the family Sciuridae. In the English-speaking world, it commonly refers to members of this family’s genera Sciurus and Tamiasciurus, which are tree squirrels that have large bushy tails, and are indigenous to Europe, Asia and the Americas. Similar genera are found in Africa. The Sciuridae family also include flying squirrels, as well as ground squirrels such as the chipmunks, prairie dogs, and woodchucks. Members of the unrelated family Anomaluridae are sometimes misleadingly referred to as “scaly-tailed flying squirrels”. Common squirrels include the Fox Squirrel (S.niger); the Western Gray Squirrel (S. griseus); the Douglas Squirrel (Tamiasciurus douglasii); the American Red Squirrel T. hudsonicus; and the Eastern Gray Squirrel (S. carolinensis), of which the “Black Squirrel” is a variant. Unlike rabbits or deer, squirrels cannot digest cellulose and must rely on foods rich in protein, carbohydrates, and fat. Early spring is the hardest time of year for squirrels, since buried nuts begin to sprout and are no longer available and new food sources have not become available yet. During these times squirrels rely heavily on the buds of trees, in particular, those of the Silver Maple. Squirrels are omnivores; they eat a wide variety of plant food, including nuts, seeds, pine cones, fruits, fungi, and green vegetation, and they also eat insects, eggs, and even small birds, smaller mammals, frogs, and carrion. In tropical areas, these foods often replace nuts.